A new fabric has been created using Harris Tweed that will permanently give off the smell of whisky. Two of Scotland’s iconic brands have collaborated to create a “fabric of flavour”. The cloth has been developed by Heriot Watt University's School of Textiles and Design in Edinburgh and Galashiels. 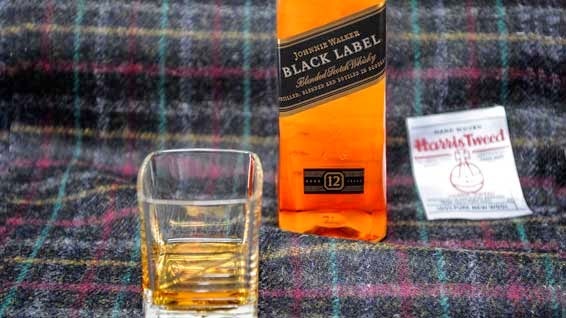 The "smart fabric" has been developed for Johnnie Walker Black Label and Harris Tweed Hebrides. The collaboration has resulted in a fabric design which reflects the colors of the whisky ingredients. The Harris Tweed fabric also carries a unique scent named Aqua Alba, which is based on the ‘key notes of the nose of the liquid”. The nose of the liquid is referring to the aromas released from a glass of whisky. The scent called Aqua Alba has been designed to replicate that smell. Johnnie Walker said of the aroma: "The unique scent, inspired by the nose of our liquid, echoes the masterful whisky production process. "The key notes of rich malt, golden vanilla, red fruit and the trademark dark chocolate tones have been layered onto the fabric to achieve the unique final nose and finish of the Johnnie Walker Fabric of Flavour”. Donald Mackay, who heads the finishing department at the Harris Tweed Hebrides mill in Shawbost, Isle of Lewis, said: “I have worked with aromas in the past but they were only meant to withstand one dry clean. The process we have devised for Johnnie Walker means that this scent is layered into the fabric throughout the finishing process and is permanently imbued in the tweed”. They are planning to market a range of products using the smart fabric. In the opinion of Apparel Search, this may lead to trouble for people who are pulled over for speeding or other traffic violations. Do you really want your clothing to smell like liquor if you are pulled over by the police? Probably not a good idea to smell like booze while driving. According to Johnnie Walker, the cloth smells of "rich malt, golden vanilla, red fruit and dark chocolate tones". The tweed used was woven at Harris Tweed Hebrides' mill in Shawbost on Lewis and has the colors of the ingredients of Johnnie Walker Black Label. The first of a range of products by Milan-based designer Angelos Bratis is unveiled in Berlin and will be marketed in Germany, Greece, and Belgium to start. This is certainly a creative project and we look forward to seeing if this trend makes its way to the United States fashion market. It is nice to know that Johnnie Walker and Harris Tweed Hebrides have a whisky scented fabric. We wonder if Mexico will create something with a Tequila scent so that they can compete with Scotland. Harris Tweed Hebrides, the award-winning company based at Shawbost on the west coast of the Isle of Lewis, now accounts for around 90 percent of Harris Tweed production. They export to over 60 countries and our customers include Alexander McQueen, Chanel, YSL, Paul Smith, Margaret Howell, J Crew, Rag&Bone, and Vivienne Westwood. Harris Tweed Hebrides, was founded in 2007 when Harris Tweed was at a low ebb, is generally credited with having revitalized the industry and taken the famous fabric into the front-line of 21st century fashion and design. Learn more about Harris Tweed here on the Apparel Search fashion blog or visit The Harris Tweed Authority for educational information about Harris Tweed.